Customer Picture Number 22 Selected. Cool Car decals applied. 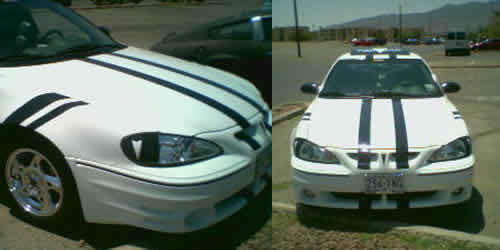 This one of a kind pontiac sports racing stripes and headlight mods. Not to mention all the under the hood performance mods as well. James has managed to give his ride quite a unique style that most likely won't be seen like this on another car. Lesson learned : BE CREATIVE ...more to come!